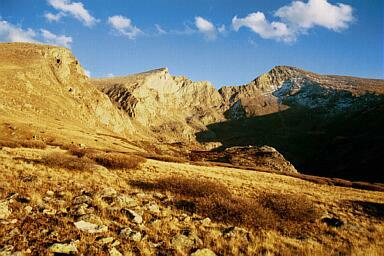 How to get there: A good starting point is Guanella Pass. To drive there, take I-70 west from Denver to the small village Georgestown. The road up to Guanella Pass starts in the southern end of town, there are many signs directing the driver to Guanella Pass. The road is paved about half way to a reservoir and a power transformation site, from there the road is a good quality dirt road. There are a couple of large parking areas just before the road reaches its highest point. 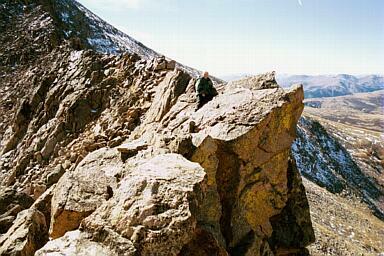 Route description: Our route started at the summit of Mount Bierstadt. An alternate route would be to follow our return hike both ways. From the Bierstadt summit one should climb down the ridge to the Sawtooth, a ridge connecting Bierstadt with Mount Evans. 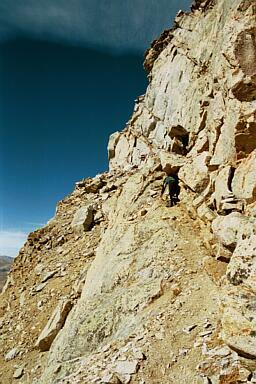 This ridge is generally very steep to the west (left side), while considerably less difficult on the eastern side. We proceeded along the top ridge a few meters from the Bierstadt summit, then a choice of going left or right (of a blocking rock structure) had to be made. It seems like most people drop east (right), in fact, for a considerable part of the ridge traverse one can go low on the right side, but then one is really not doing a ridge traverse any more. We turned left and hiked down a gully for about 10-15 meters, then regained the main ridge ( downside from the obstacle) via a nice "shelf" of rocks. The hike should now try to stay as high on the ridge as possible, in a few places we had to sidestep more difficult sections to the right side, however, one never needs to go very far off the main ridge line. There are (short) sections where hands are needed, and one spot with nice flat (but narrow!) 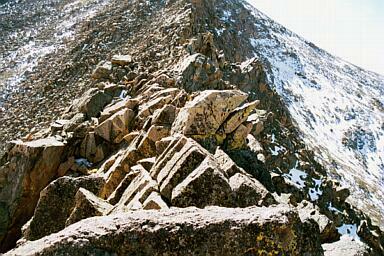 rocks that form a walking path on the very top of the ridge. As the ridge rises distinctly, one proceeds to scramble up a fairly steep section (look for a couple of small cairns), then reach a more level area where a small trail leads west (left) onto a connecting ledge that leads into a large and fairly wide gully with lots of loose rocks above a significant vertical drop further down. Contour around this area above the loose rocks and find a narrow, but distinct ledge that leads upwards and to the left. 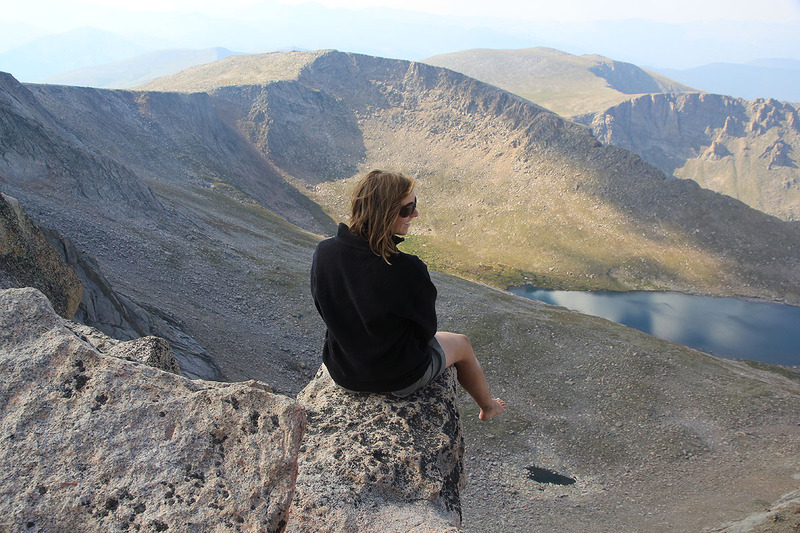 This ledge ends at a very pronounced flat area forming the left "upper corner" of the mountain face that otherwise seems to block the access to Mount Evans from the Sawtooth. For hikers coming in the opposite direction there is a fairly large cairn at the top of this route indicating how and where to start the descent. 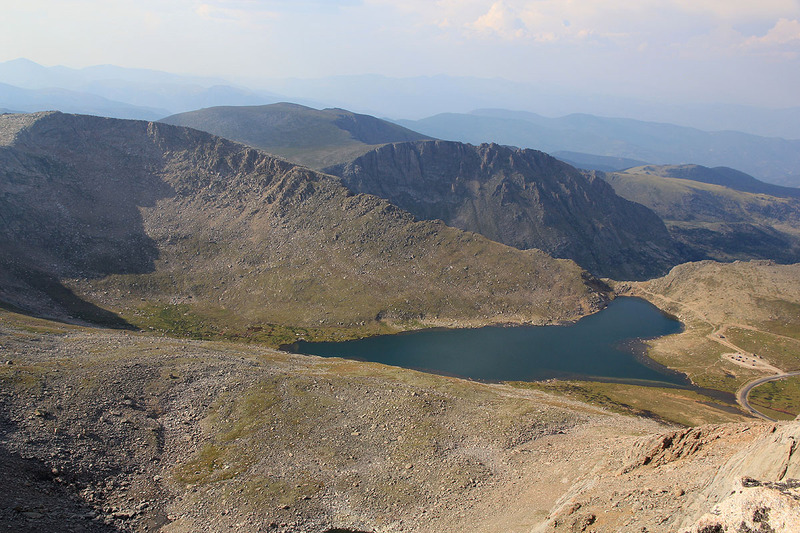 The hike from the end of Sawtooth to the highest point of Mount Evans begins by crossing a fairly level section that also connects across to Mount Spalding (4219m) then follows a nice summit ridge with several (false) summits. There is a fairly steep drop to the north. The last false summit is quite high, in fact, it can only be a few feet? lower than the proper summit further onwards. The road and the parking area come into view at the very end of the hike and can be completely avoided. It is easier and faster (but less interesting) to cover this section of the hike by staying off the ridge on the south side. The return route started back along the north-west ridge of Evans, staying on the south (left) side of the ridge aiming for the low saddle between Sawtooth and the Evans ridge. Descending north-west, the gully coming from Mount Spalding and going west should be crossed as one stays above the cliffs at about 3960m. (We got a bit low and had to climb slightly after crossing the gully, higher up this gully may not be so noticable.) A gentle descent in easy terrain continues north-west towards the creek that runs south-west from the saddle between Gray Wolf Mountain and Mount Spalding. Cross the creek and aim for the triangular shaped lake near Guanella Pass. This line of hike will get you down to a small pond just before a small hill with trees. There is a small trail going around the pond on the south (left) side. Continuing up the open fields towards the small hill and one will (finally!) find a quite visible trail leading over and down the small hillside. This trail is quite nice as it leads directly towards the parking area and avoids most of the willows. The final stretch is a bit more confused, but does go through (the willows) and ends directly at the (lower) parking area. Thus, this trail does not branch off from (connect with) the main trail going to Bierstadt. The best landmark for hiking in the opposite direction is the small but distinct hill (with large trees on it) about 1.5km east (slightly north of straight east) of the parking at Guanella Pass. Comments: I did this hike with Pål Jørgen, age 11 in mid October, but there were only a few patches of snow on the Sawtooth ridge. It is clear that the final section of the Sawtooth can get quite a bit harder with more snow and require technical gear. It took us 2:15 from the car to Mount Bierstadt, we enjoyed the Sawtooth in warm October sunshine for about 2:30 hours and then another 1:30 to scramble along the north-west summit ridge of Mount Evans (including a couple of rests) to the summit. We were at the summit as late as 1600 (due to a late start from Boulder) and realized that it being mid-October, we should hurry back before dark. We hit the car at 1845, about 2:30 from Mount Evans and just before dark. It is clear that walking the final mile in the dark among all the willows and mud might not be the happiest memory, so one should be careful watching the time on this hike. 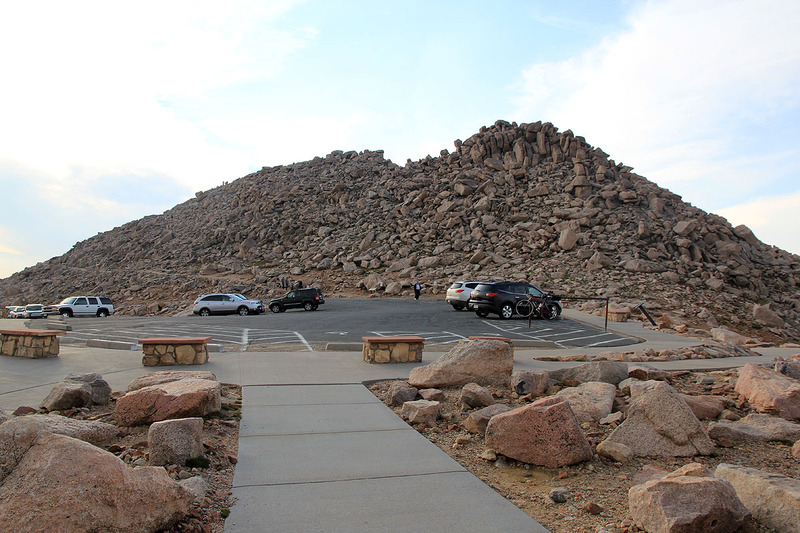 I visited this peak again on August 14, 2012. This visit was a drive-up. 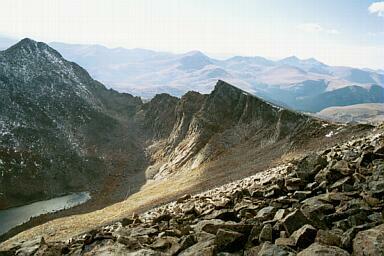 The Sawtooth as seen from the summit of mount Bierstadt. On the ridge we tried to stay high. The Ledge completing the traverse of the Sawtooth. 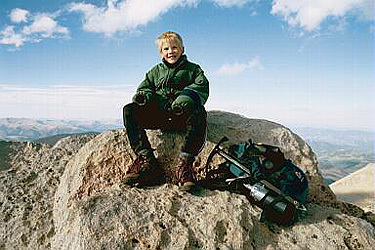 Mount Evans Pål Jørgen on the summit. 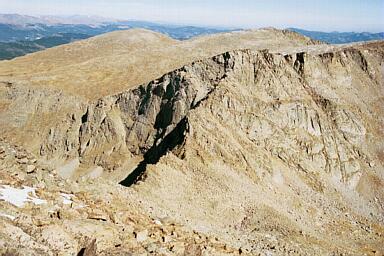 The Sawtooth as seen from the Mount Evans side. Abyss lake to the left. The Sawtooth just before sunset. Bierstadt to the right. Summit Lake, as seen from the top. 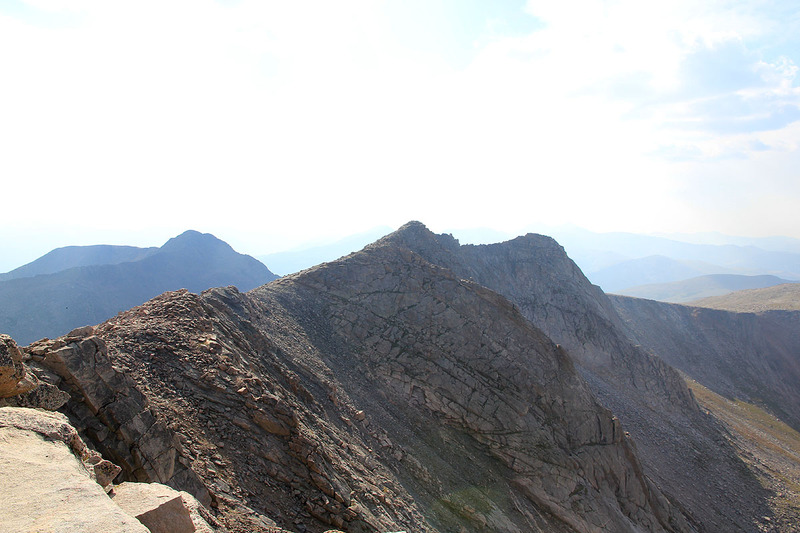 The Evans summit ridge, the Sawtooth ridge is behind. 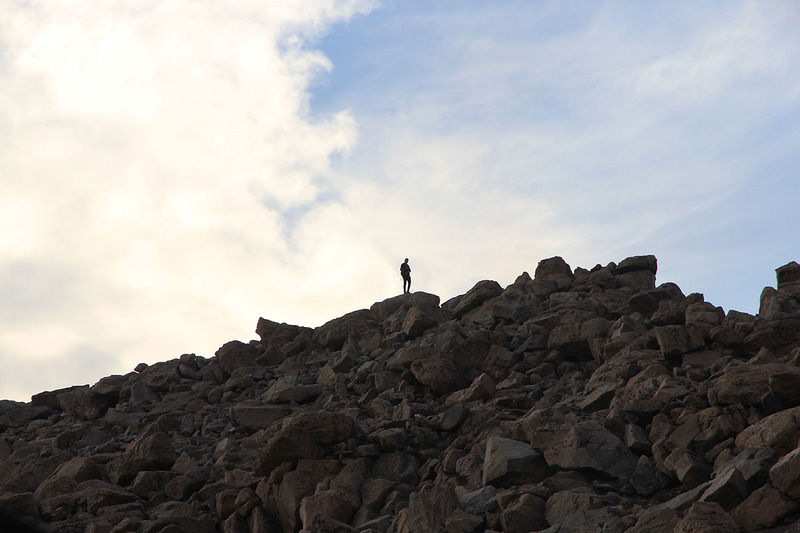 Rob Woodall on Mount Evans, completing the traverse from Mount Bierstadt.